Yes, however the earlier diagrams in this thread show the tach hooked to TAC. Maybe people were having issues with it powering the tach and that's why the updated picture shows the relay method? Last edited by kodja; 11-15-2017 at 01:23 PM..
Just finished my install. Followed DET17s footsteps and went from a gold cold chipped ezk to stock blackbox. I used a 203 powerstage, 407 coil, relay running the tach, and the BTI valve cover mounting bracket. Btw, the spark board from cflo still appears to have the spark outputs reversed. No big deal, just make sure you do a test start/run before you make the final crimp/solder. Yes, we've verified that this whole batch has the outputs reversed. So until further notice, please swap the 1-4 and 2-3 outputs when you do your wiring. It has to do with how the boards were programmed. Everything still functions as normal though. After almost two weeks of running the new spark, I like it. The car definitely pulls hard in the upper rev range. A lot of people don't give the T cam enough credit, it'll pull to redline in 3rd. My car doesn't have much mods other than running 12psi on a 13c and the obx 2.5 catback. Can't judge any mpg differences as I've been too busy enjoying the new power vs. driving like I normally do. This weekend I plan to finally have enough time to install the do88 intercooler and B or ipd cam to complement the new spark. About the relay driving the tach. You just take the redwhite (1) and blue (15) wire that normally are connected to the ignition coil and connect these to the 85 and 86 connectors on a relay, after taking out the flapping mechanism ofc. I saw this post from Karl and I thought the relay needed a resistor soldered in? Or is it just that easy by connecting those 2 wires together? Interested to see what you have done. Last edited by Venlonaer; 01-05-2018 at 05:12 PM.. Sorry in advance for what might be a stupid question, but can I test the 1+4 and 2+3 wires coming out of my EZK on my wasted spark install for voltage with a multimeter or test lamp? I suspect I damaged the EZK mother board after going back in and re-soldering all the wires for the wasted spark board as one came undone from vibrations. It's not a big deal, I can get my hands on a new EZK box easily; it's just to check that that actually is the cause of no spark. Edit: Got it to work. My wasted spark board wasn't wired up correctly hehe. Last edited by MrKrabs; 01-25-2018 at 12:27 PM.. I installed wasted spark last week on my 940. Works like a charm, many thanks for the development and clear instructions. However, my tach is not yet working unfortunately. I have a Mitsu J702T power stage with tacho output. I connected the red/white wire which was originally on the 1 terminal of the coil to this tach output terminal (I assume this is the tach wire). No tach unfortunately. Am I overlooking something? Edit: Appears the wiring is correct. Tomorrow I will measure the output voltage at the "tach" terminal. Last edited by Sjeng; 03-01-2018 at 04:48 PM..
Stock leads work with the 2x2. I have my coil and powerstage mounted above the valve cover. Works fine, but I'm not sure how the the heat from the valve cover will affect the life of them, mainly the powerstage. Yes, that was my concern too- perhaps I’ll go with the same approach and keep a spare powerstage in the car. Depends on which car you're talking about. 740/940: yes. 240: no. The coil end of the plug wires are different between the two. The Bosch 2x2 coil uses the 740/940 type, meaning the post on the coil is the same as what's on a 740/940 distributor. If you have a 240 with wasted spark (as I do), you can use a set of 240 wires if you change the coil end connectors to the 740/940 style. Ah, my question didn’t say- I’ve got a 240. Thanks for noticing that potential hiccup, I’ll get hold of plug ends/new leads from a 940 in amongst the collection of other parts. I installed the 2nd chip from you Thursday afternoon into a gold ezk, didn't have to dig through someone else's mailbox this time. Had a no start this morning before work. No spark to ws or through the stock setup... Weird that it suddenly stopped this morning. Ran fine for the last 100 miles, let it idle and parked it before going to bed. Running on the black box for now. Hope I didn't fry/short the box somehow. Last edited by nitroboie; 04-14-2018 at 07:27 PM..
Hmmm- ive read a few threads where people have had problems with gold ezk boxes and the wasted spark board. I’ve got a a gold ezk with a changed chip in it in place currently, I’m very keen not to brick it as they’re getting rare and expensive here in the Uk. Should I get hold of a unchippable Black ezk (much cheaper) and put the wasted spark board in that? Ok, to put it another way- will the wasted spark module work with an unchippable ezk and if I went down that route would there any disadvantage over my current chipped ezk? I don't have any direct experience with the unchippable EZK, but I'll look into this for you. Ok thanks- but really the question is how to avoid bricking my in use and working chippable ezk. Perhaps there haven’t been that many threads with people saying that has happened, but I seem to recall a few. Yes, the module works with the non chippable ezks. The install is the same, somewhat easier as the daughter board doesn't get in the way of running the outputs to the opposite side of the box. My first install was on a non chippable box, because they're easy to find and very cheap. My 2nd install was to my original gold/chippable box. Det17 is/was also running a non chippable install. The only disadvantage is you won't be able to have custom maps without adding the daughter board with the chip socket. If you don't feel comfortable doing it, practice on a non chippable box first. Ok cool - thanks for the advice. I've done quite a lot of soldering etc. so i'll add the board to the chippable ezk and then report back. I posted in wanted because earlier today i couldnt see the images in this thread. I fixed that but still have a few questions. Can i remove the original volvo power stage and associated unused wiring? Does anyone know if an Autometer tach will work directly of the j702T? Last edited by Mbeas96; 04-22-2018 at 09:27 PM.. I'm very close to going thru with the wasted spark install. I have the bosch 2x2 coil and miata power stage, im a few days away from ordering the wasted spark board. Using a gold chippable ezk with a custom chip installed should not have any adverse effects, correct? I have access to a ezk that does not have the daughter chip, but I would like to keep the option to adjust/have other people adjust my ezk tune. Plus, while helping with my brothers install, he used 18 gauge IIRC (tho it might have been 16) on the board to ezk connections and it would of been a lot easier if we went with a smaller wire. These are just signal wires right? So what's the smallest wire one could use, like 22 gauge? 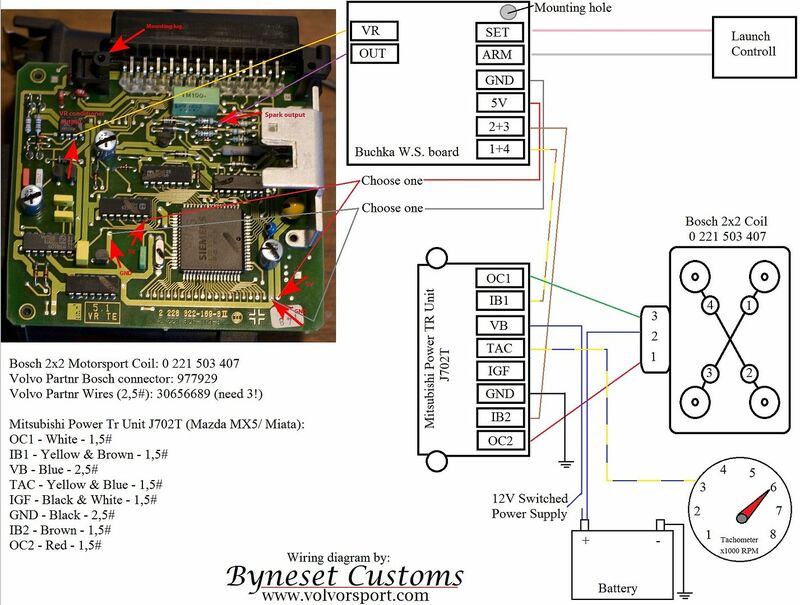 Then, wires that go from the wasted spark board to the power stage and from power stage to coil? I would guess bigger gauge for those, but I'm no expert in wires.